What systems were used onboard Buran to determine its position during reentry and landing? Since Buran has managed to return without crew on board, I assume computers had to know its position relatively accurately as it approached the runway for landing. How was this achieved? I haven't found much about the Buran GNC systems in general. 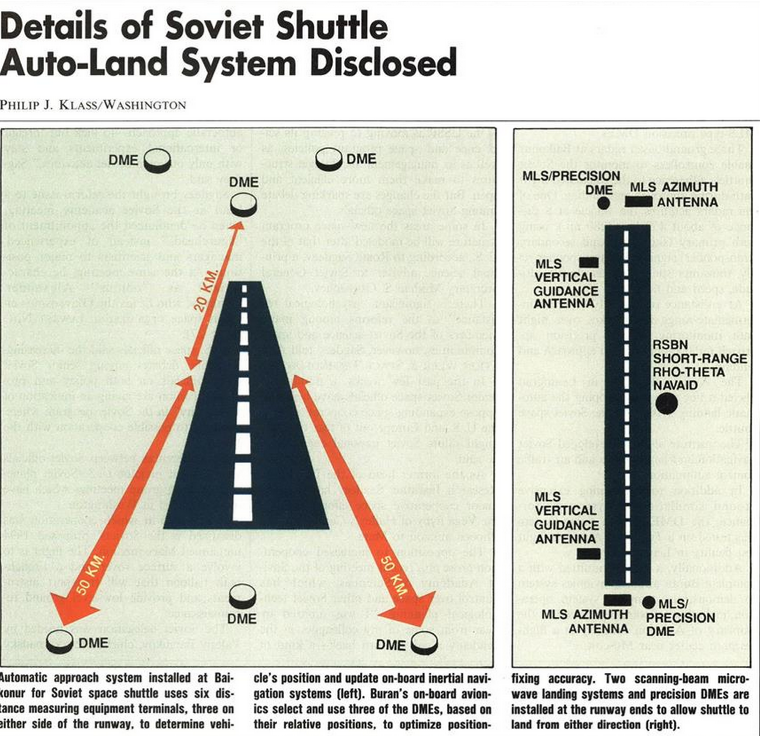 You asked about the landing, though, and there was an article in the December 12 1988 issue of Aviation Week (sorry, paywalled) that described its autoland system extensively. Unsurprisingly, it was much like the US Shuttle's system, relying on ground based distance-measuring equipment to update its inertial guidance system. This is similar to how the US shuttle used TACAN (TACtical Air Navigation) stations for landing. On final approach, Microwave Scanning Beam Landing Systems (MSBLS or just MLS) were used, again similarly to the US Shuttle. Not the answer you're looking for? Browse other questions tagged landing soviet-union buran or ask your own question. Could the Space Shuttle have landed on any long runway other than those specially reinforced at Kennedy (TTS), and Edwards (EDW)? If you had 150 kg of ejectable mass prior to entry and another 150 kg during entry/landing of a Mars mission, what could you do with it? How did Energia Buran handle center of mass during flight? Could the Orion or Apollo command module safely land on land in an emergency due to a navigation error? Could a Falcon 9 booster return to Earth with its payload safely in an emergency? What are the questions and issues related to Kosmos 482's configuration and eventual reentry?